How many referrals do you have? I’m sure you have shared your referral link to every social media platform, including Facebook. You have shared it so many times that you can’t even count. You have asked your friends/followers to sign up to a great site, hoping to get a few referrals. But, after doing all that how many people have signed up under you? 2, 5, 7 or 10. Let’s say you have 10 referrals. How many of them are active? It’s pointless to have 10 or even 100 referrals if they aren’t active. It is the same to have no referrals. So, by using the ancient method; you don’t only get a tiny number of referrals, but most of those referrals are not active. The main issue is that mostly the referrals that sign up under you when you share your referral link in a group or as a status update are not interested. They have never used a site like the one you shared (let’s take Swagbucks) and are not familiar with the environment. So most of the people won’t even care to click the link. If some people do sign up their reason may be: they wanted to try something new (they are not interested in making money online at all). So Surveys and offers might seem to them as ‘personal information stealer’, or they may get banned for doing something wrong. This is the problem when (if) you are able to get referrals from Facebook. The reason why you don’t get targeted referrals is that the persons you want make your referral are smart and even worst; don’t trust you. They have been a victim of scams. And know how to avoid them. They will mostly go to Google and look for reviews and complaints regarding Swagbucks. And won’t sign up until they are sure of its legitimacy. They are not going to sign up just because you say so or shared a link. Actually, they especially won’t sign up because you shared your referral link. They know you just want to earn the commission. 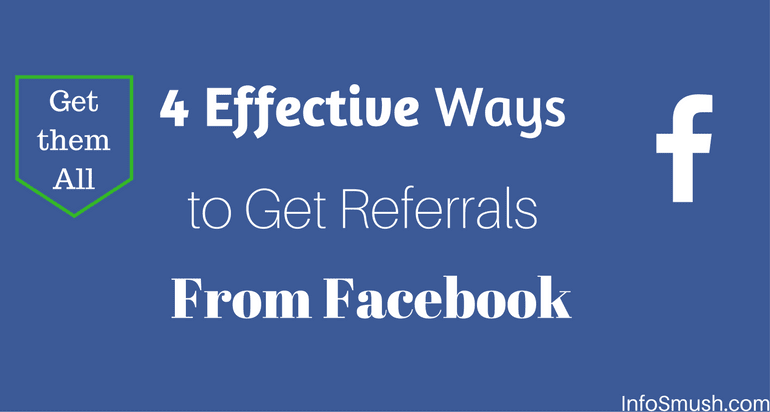 You ought to do more and better to convert your Facebook buddies into referrals. What is the best way to convince and clear anyone’s doubts? This method is the most effective way to get referrals because you are directly chatting with a person and not a crowd. This approach not only makes the person comfortable but also encourages him to remove his doubts by asking questions. He knows that he is talking to a person, not a company. But this method may also backfire. The person you are chatting with may think you are some hacker or spammer. So, you need to be careful about what you say and how you say it. And don’t ever sound like you are trying to make him your referral (which you are). You can use this method to convert your friends or persons you don’t even know how got into your friend's list, into referrals. It is easier when you are talking/chatting to your friends. You know how to convince or even force them, and they trust you. The chances of them becoming your referral are naturally high. And I guess their number isn’t very high, so start with them, then go chat with strangers. When you are talking to persons you don’t know, your chances to make them sign up, decreases. Not only that it's awkward. And the hardest part is to get them talking. Because some people may think you are a freak and won’t even reply. So our priority is to get the conversation going. A question is the best way to get anyone’s attention as it persuades the targeted person to reply. So, your first message should contain a question. But don’t be too direct. Don’t start your message with a question. First, greet him/her. Like this: “Hey! “Name” do you know what Swagbucks is? And how you can make money with it?”. It is the basic structure. But don’t use this all the time. Try different questions in different ways and find out what works best for you. Once the conversation has started, don’t skip to the signup part. Remember he doesn’t trust you yet. So your top most priority is to earn his confidence. Tell him about your experience of Swagbucks (payment proofs, how you make money with it, the difficulties you faced, etc. ), a bit about your personal life and everything he needs know. In short, Treat him like a friend. Once he knows everything that you do, and you feel like he trusts; you can ask him to sign up. But there is still no guarantee that he’ll even click on the link. To raise your chances provide him with two links: one your referral link and the other standard link. And give him the authority to choose whether he wants to be your referral or not. It will tell him that you are not forcing him to be your referral but giving him an option and this will get you even more trust. Your followers/friends should never feel like you are a company who is just promoting itself to gain more profit. Don’t ask them to sign up. Just Provide a link. Share your payment proofs and what you will use that money for. Share how you earned that 100SB today. Or how you missed to reach today’s goal. Share what you lost/won in Sweepstakes. Share new offers, earning opportunities, news, etc. Some of your followers may not even know what Swagbucks is, so you can also write a short; review between 100-250 words long. And don’t forget to add an eye-catchy image to your status updates (if not inappropriate). You can make attractive images at Canva.com. That’s where I made the cover image of this post. Facebook groups are a powerful the way to reach a huge audience. to get referrals from FB Groups just do the same as mentioned above in “status update”. This method is a bit different than the three mentioned above. It is not to get referrals about which the Facebook page is. But the Facebook page will help you get referrals for other sites. People will mostly like a page about Swagbucks if they have already joined it and since Swagbucks already has a Facebook page, creating a fan page would be useless. So the question is; what kind of page should you create? The answer is a “Helper Page”. A help page is one where you help people troubleshoot their little problems. You teach them how they can earn more. Share with them new earning opportunities, latest SwagCodes. You can also post videos of redeeming your SB, completing an offer etc. Now select Brand & Product as your page type. Select Website from 'Category, and give your page a unique name and hit "Get Started". Step 2: Add a Cover Image and Picture. Now, to make your page more appealing. Head to Canva.com and select Facebook cover and design it the way you want. Go to Pixabay, there you can find almost any type of image and illustrations for free. Once you have created your cover image upload it (and see how it looks). Keep editing until you are satisfied and don't change too often. Upload your picture in the Add a Picture. This is your page's profile picture; it will be shown in the top left corner and help people identify your posts. The username of your page will help people find your page easily through searches. They can also reach your page directly, by typing it, in the browser’s address bar, e.g., you can visit the InfoSmush Page by going to fb.com/infosmush or facebook.com/infosmush . Your username should be short and should not contain numbers, special characters or capital letters. All this makes it hard to remember. A good example is the infosmush page; it only has small letters without any weird characters. To create your username click on "Create username" below picture. Step 4: Add a short description. 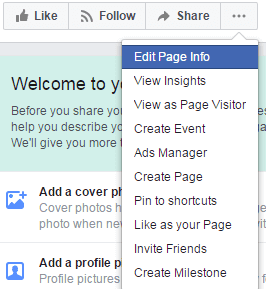 Add a short description of your page that describes what your page is all about and what people can expect from it. Don’t include phrases like “like my page”. If people like your page they will naturally hit ‘Like’, you don’t have to beg for it. To add a description: hit "Edit page info" from three dot menu. Step 5: Add a button. You can create a sign-up button, but you are creating this page as a person, not a company. You are creating this Page to get people trust you, remember. So, we will create a send message button. People will be able to send you a message directly by hitting this button. Click on Add a Button and select "Send Message" under "Get in Touch" now add a personalized automatic message (this is optional). An Instant reply is a message that is instantly sent to the user. A good example of instant replies is the reply you get when you contact support of any website/company. Now start publishing. And don’t forget to invite your friends to like your page. Was this post helpul? Do tell me how you got your first referral from Facebook. Wow, awesome weblog structure! How long have you ever been blogging for? you make blogging glance easy. The whole look of your web site is great, let alone the content material!